Common side effects include sleepiness, constipation, weight gain, and dry mouth.Other side effects include low blood pressure with standing, seizures, prolonged erection, high blood sugar, and neuroleptic malignant syndrome. In elderly people with dementiaits use increases the risk of death. Use during the later part of pregnancy may result in a movement disorder in the baby for a period of time after birth. 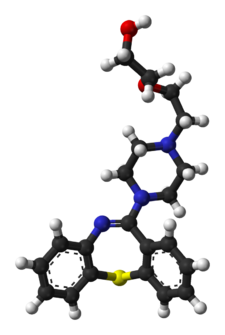 Quetiapine is believed to work by blocking a number of receptors including serotonin and dopamine receptors. I started taking this medication last night. This morning I have a dry mouth, and a bit of a foggy head… The outlook feels good though. Today is Saturday, I hope to have a peaceful day. Last night I went out for a meal with my friend. I felt good to be out, and to talk openly with her. I didn’t feel judgement. I was honest and it was freeing to talk to her. I was on quetiapine for 10 years and it saved my life. Has its complications like all of them but always felt much more comfortable and myself on Suzy Q than on any other drug they tried. Good luck on the journey! Saw your title – I am on the Q, too, and have found my life much improved after starting it almost 3 years ago now. Good luck to you! -HM.